In my early years of childless marriage, I was content with the way things were, as I’ve always been independent and I enjoyed my freedom. One day my then-husband told me that he was bored with his life as long as it was just he and I, that all he ever wanted in life was to be a father (he had an older son that he was unable to raise), and he even told me that he would stay home with our child if I continued on my ambitious track. So I stopped receiving Depo-Provera injections and conceived the following year. The problems in our marriage persisted after our daughter K was born, and during relocation to another state, we separated. K was 10 months old and had just learned how to walk. She remained joyful and seemingly unaffected by all the changes—thankfully, my sadness did not rub off on her. I was living in a new state where I knew no one, with two roommates I hadn’t lived with in years: my mother and my sister. At first, I felt relief, gratitude, and security having them there. I was spiritually and emotionally drained from years of fighting with my husband, and I felt so inadequate as a first-time mom. I spent K’s first few years in a daze of frustration and hopelessness. I was newly single, back on the dating for the first time in almost a decade. I used to think self-defeating thoughts that no one else would want me because I had a baby. That I was stupid and deserved whatever treatment I got from my ex- and other men I dated. That no man would ever love me as much, or treat me any better than he did. Counseling, my family, DivorceCare, and a new church family were my keys to overcoming divorce, but with my ex-husband living several states away, other pressures took their toll on me. I was overwhelmed when I looked at my beautiful baby girl. I doubted my capabilities as a mother because I don’t see myself as being a natural nurturer. K progressed through normal developmental stages, but she is strong-willed (like me). Dealing with potty training, tantrums, and not sleeping through the night was rough. At a year old, K couldn’t talk, and I didn’t know how to discipline her. She didn’t sleep through the night with any regularity until well after age 2, and it was almost impossible to get her to nap. I remember one way to placate her was to set her down in front of the Dora the Explorer and let her watch it all day. My sister furnished her with a sizable collection of Dora DVDs so K was in heaven. Then when she was 2, I went to a community group and voluntarily enrolled in a few of parenting classes that are sometimes court-ordered. The first class was about nurturing children ages 1-4. The classes gave me a little more self-confidence and hope, but I was still feeling lost overall. K was still hard to apply the 1-2-3 Magic and other discipline techniques I learned in the parenting classes. My methods of discipline did little to control her, especially before age 4. I felt like I didn’t know what I was doing, and I got impatient and frustrated with my daughter easily. Silly or strange as it sounds, I found myself somewhat fearful of being alone her when both my sister and my mother were out of the house. I felt so much relief when they were around. My daughter gives hugs and kisses very freely and frequently throughout the day without prompting. She is very demonstrative with all her feelings. K is a girl who likes to smile, laugh, and hug people, whether she knows them or not. She will hug a server in a restaurant just as willingly as she would hug her favorite cousin. I’ve always provided for her wants and physical needs, but going through my own pain and struggles during her early years did not leave much energy to attend to her emotional needs. K didn’t take to me as much as she did my sister in her early years. I’m not a nurturing mom, I’m more of a provider, so I didn’t take much time to play with her. I felt guilty sometimes for feeling the way I did around K, that my life would be easier if I wasn’t a single mother, and how much freedom I lost. I was feeling burdened, overwhelmed, and hopeless. As my daughter grew from ages 3 to 5, I looked at her as a responsibility and thought of her more in terms of how to get her to follow rules and be obedient than relationship. I was over my ex-husband, but I didn’t know I was still depressed. If I put my hands on my daughter to discipline her, chances are that after a couple of tries, I would get angry, and hitting her didn’t help the situation because we would both feel bad. I was afraid of how angry I got with her, especially in the phase when she had frequent temper tantrums, so I sought help. I never considered that the continued major stressors in my life over the years would contribute to what my therapist told me was clinical depression. In my case, my anger stemmed from frustration, impatience, lack of control, and helplessness. At times, my anger manifested as depression. I thought about why Kaia’s father moved farther away from us instead of being closer to help me with her. He started another relationship during our separation, and I was resentful that his child from that relationship was seeing the financial and emotional benefits of having him around when K didn’t. Sometimes I even thought about suicide, figuring irrationally that because I was such a failure as a person, that K would be better off without me, and I could be relieved from all the emotional pain of the separation and divorce. My mother and sister helped me a great deal with K, but they couldn’t help me with my mental mess. My parents got separated at the same time I did, so my mother was dealing with her own depression. I worked from home, and she was not working, so I was financially supporting her while she helped me care for K each day. As women, we have a strong care-giving tendency, and tend to help others and put ourselves last. Dr. Kisha Braithwaite Holden, Assistant Professor of Clinical Psychiatry at Morehouse School of Medicine, adds that with depression, taking care of ourselves becomes less of a priority among African Americans because of the stigma associated with it, and the discomfort. “We need to openly disclose the feelings and emotions involved in the process, and create and maintain an ongoing healing process to get close to optimal health,” Dr. Holden says. I had to get help to deal with all those negative emotions. I wasn’t ashamed to talk to a therapist, but when she suggested that I was clinically depressed, I went into denial. I also rejected her suggestion of seeing a psychiatrist that could prescribe me with medication to help ease the pain. I wondered whether medication could help me. Depression continues to have a stigma attached to it, especially in the black community. According to a survey by Mental Health America, 63 percent of African Americans believe that depression is a personal weakness. 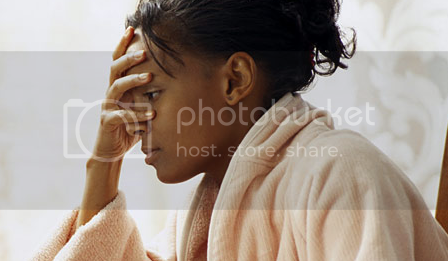 African American women have a rate of depression that is roughly 50 percent higher than that of White women. And of that number, African American women who suffer from depression are largely misdiagnosed and/or untreated: only 7% receive treatment, compared to 20% of White women. I thought, “What is wrong with me—what does that say about me if I have to take a pill to feel better?” But if I would take a pill for physical pain, why not take one for mental pain?